Oatmeal Cookie Banana Ice Cream is ready in just 5 minutes and tastes like dessert but has no-added sugar and is rich in fiber and protein. To me, banana ice cream is one of the best known healthy "hacks". It tastes like ice cream but is so much healthier. You can customize it however you like. I have made chocolate peanut butter banana protein ice cream, mint chocolate chip protein ice cream and 3-ingredient strawberry banana ice cream. My daughter loves all of these and so do I. My favorite thing is to sit down with her and share a bowl of it. She thinks that she is getting a huge treat but I know that it is actually quite healthy. I love throwing protein powder in my banana ice creams because it makes it more filling. This banana ice cream is actually so healthy that you can eat it for breakfast. Yes, a dietitian said that you can eat ice cream for breakfast! When ice cream is this healthy, you can eat it whenever you want! Feel free to customize it using your favorite ingredients. This oatmeal cookie banana ice cream tastes just like an oatmeal raisin cookie mixed with ice cream. It is rich in fiber from the bananas, oats and raisins. Has protein from the milk, protein powder and a bit from the oats. It has no-added sugar and no funky ingredients. What is better than that? 1. 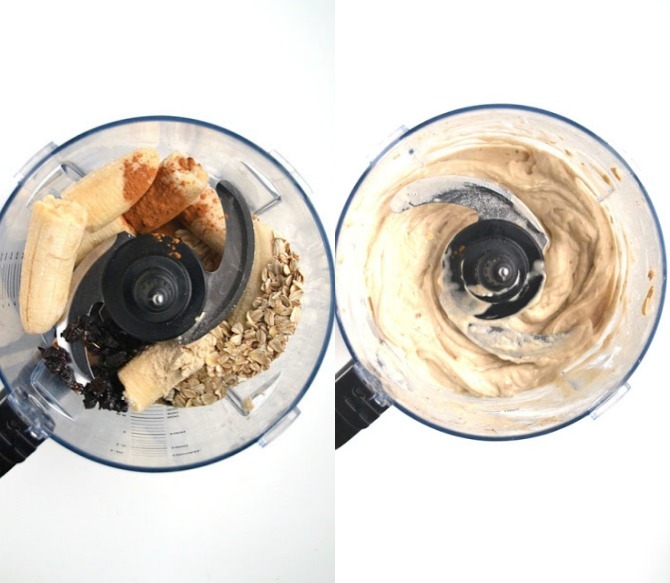 Process all ingredients in a food processor until smooth. Top with extra raisins as desired. Eat immediately or freeze in storage containers or mason jars until later. Looking for a great protein powder to try? Buy it here. 3-ingredient strawberry banana ice cream.